This is the Salt Lake LDS Temple. 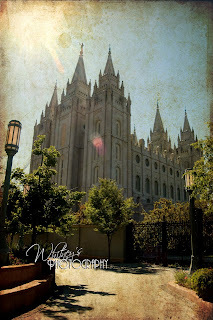 I have thought that possibly I would attempt to create an artistic view on as many LDS temples as I have the chance to view. In the effort to do this, I have decided to start a "series" if you will, of some of my photos of these beautiful and holy places. Each one has their own distinct beauty, and I hope I have captured at least a small piece of this. Please let me know what you think about it!! Oh my I must have that! Beautiful!!!! I love your Temple series! Hey I was wondering are you selling them? I love the Idaho Falls one.